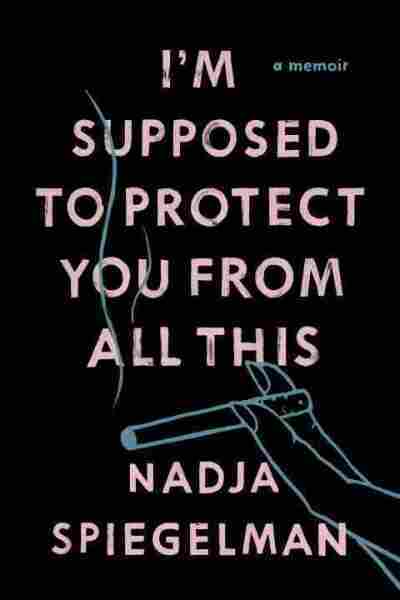 'I'm Supposed To Protect You From All This' Is Memoir Fraught With Mystery Nadja Spiegelman — daughter of graphic novelist Art Spiegelman and New Yorker art editor Françoise Mouly — has written a memoir about her mother, her grandmother, and their flawed family memories. Family stories get passed between generations, and like a lot of cherished possessions, they sometimes get nicked, smudged, frayed, or otherwise changed. Nadja Spiegelman has written a memoir of a mother she thought she knew, which resonates through the recollections of the grandmother she might have misunderstood. Her mother is Françoise Mouly, art editor of The New Yorker, and her father is Art Spiegelman, the graphic novelist. In fact, her father's Pulitzer prize-winning graphic novel Maus is dedicated to Nadja. Her memoir is called I'm Supposed to Protect You From All This. She tells NPR's Scott Simon that she always knew there were missing pieces in her family history. "I grew up knowing there was a life my mother had left behind in France, and a reason she had wanted to get away," she says. "Understanding that there were hidden dangers and certain things in our relationship that to me had no explanation." I noticed how she reacted when we would go for Christmas dinners in France, and her anxiety would skyrocket, and she would suddenly revert to a version of herself that was so different from the powerful woman that I saw every day going to the New Yorker offices and making her own children's books. And there were also things that happened when I started becoming a woman that were tensions I just didn't understand. I grew up knowing there was a life my mother had left behind in France, and a reason she had wanted to get away. Understanding that there were hidden dangers and certain things in our relationship that to me had no explanation. My grandfather was a very renowned plastic surgeon in France and constantly had women coming up to him and saying, "what do you think, Doctor, can you fix me?" And therefore really didn't have a clear understanding of boundaries, even when it came to the women in his own family, and crossed a few of those with me ... I do regret that my grandfather passed away before I started working on this book, and that this is an incredibly one-sided vision of him in which he doesn't get to speak for himself. I don't think anybody is black and white. On the other hand, I was trying to make a story that was very focused on just the subjective memories I, my mother and my grandmother had of our own lives. And in that subjectivity, he does not come off very well. She says, "did I ever tell you when I decided to have a second child?" and then tells me that when I was a baby, she loved my bathtime, because it was the only moment where she was able to have a second to herself. I loved being in the water, and she could smoke a cigarette or read a book, or do whatever it was that she wanted to do, but that one afternoon I insisted, "no no, don't leave me, stay with me," and so she stayed, but felt very trapped by me. And the force of how trapped she felt scared her, and she left, slamming the door, letting me cry, and decided to have a second child to break the intensity of the bond between her and I. It's a difficult story to be told. On the other hand, whatever the reasoning was, I am so grateful to have had a brother ... and I think that need to break the intense bond between mother and child is something that allows the child to grow. On her mother saying, "I don't need your forgiveness"
She doesn't. My mother was such a ferociously powerful mother — and I don't, at this point, having learned so much about her life and what she's been through, I don't feel the need for her to apologize or a need to forgive her either. I just feel this very profound understanding. There's a moment in the book where my mother gets into a fight with her mother and relates it to me later, saying, "my mother snapped at me, 'shut up!' and I felt so grateful, I felt like a child again, and I felt like I hadn't invented that mother who had hated me when I was a girl, and I was so grateful to see that she still existed." When my mother told me that story, I couldn't understand what she was talking about. But now I do, because the past has the same quality as dreams, in the sense that as soon as it's over, it's hazy and murky, but while you're living through them they're so vivid. Our adolescence feels so vivid to us while we're living through it ... and by the time you're a little bit older, even just outside of that intense moment, your adolescence feels like a dream, and it's hard to remember there was ever that intensity there.